Since our very first post, Lauren’s husband Scott has been bugging us to write something sports related. Although, we have told him numerous times that our readers are just not interested in scores and play by plays, he did finally win us over. Last year, we decided it would be fun to put together inspiration for a Super Bowl soiree, and this year we decided to continue the tradition putting together a menu to serve your guests based on the local cuisine of each Super Bowl team. This year’s menu is a little bit formal, a little bit festive, and a whole lot tasty. 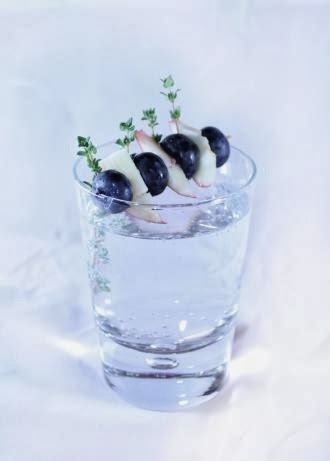 This Seersucker Sling Cocktail combines apple vodka and tonic water and is garnished with fresh thyme and alternating peeled apple slices and blueberries. This represents the fruit Seattle is known for while keeping in the spirit of the team colors. There is more to the Denver food culture than the Denver Omelette. This city is home to some of the country’s best Mexican food (especially dishes filled with green chile). 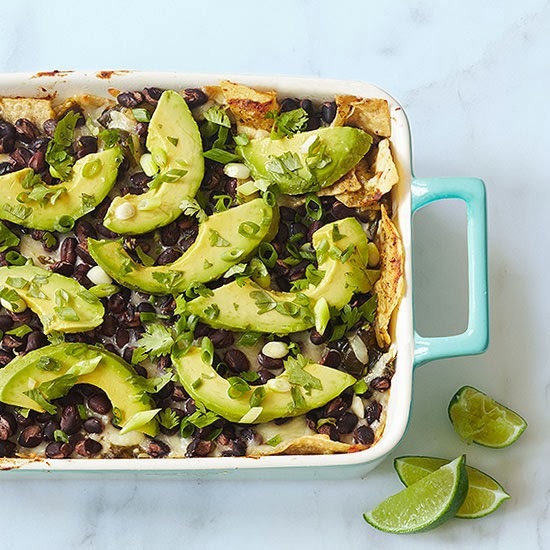 This recipe would be great to munch on during the big game! A handful of fast casual chains, such as Chipotle, got their start in Denver, Colorado. 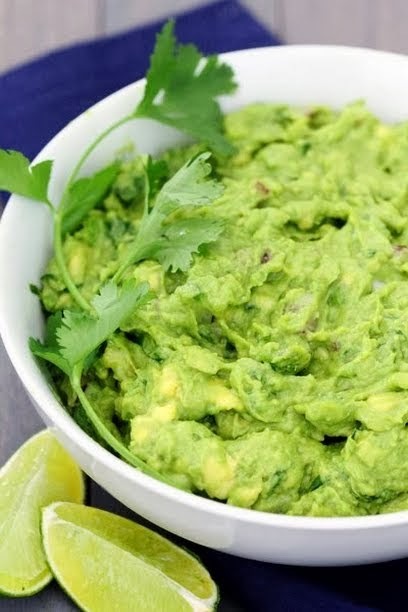 We love the taste of Chipotle’s guacamole and couldn’t resist adding this copycat recipe to our Super Bowl menu. Why mess with a good thing? 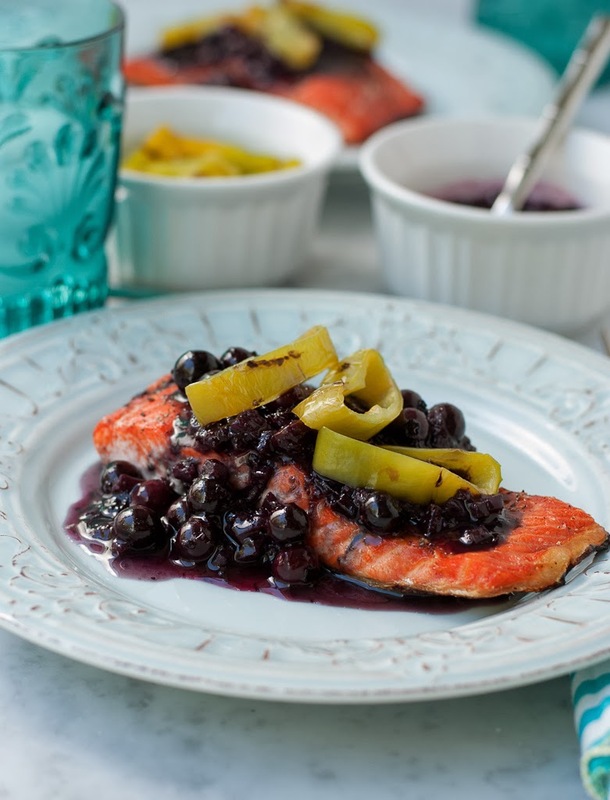 We have never tried blueberries and salmon before, but after discovering this recipe that says (and we quote), “This was life changing”, we can’t wait to try it out. Since Seattle is known for its seafood (especially Copper River Salmon) as well as berries, this seemed to be the perfect marriage of the two. The addition of the green chiles shows that these two teams really can work together. 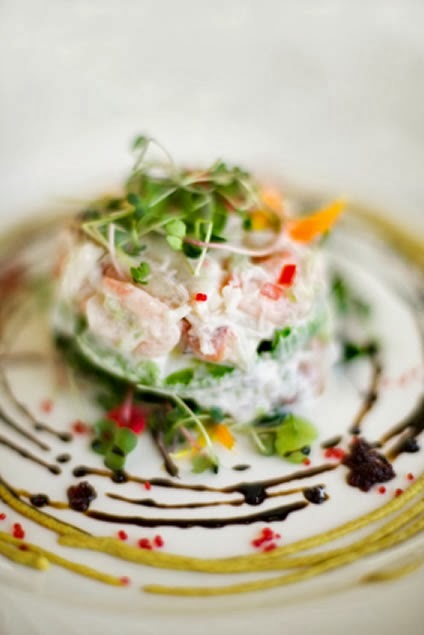 Seattle is also known for its Dungeness crab, making this salad the perfect addition to our meal. This salad is beautiful with its striped green tomatoes, sweet crab, and spicy radish sprouts. The balsamic vinegar dressing brings all of the flavors together. Football and grilling go hand in hand just like chocolate and cherries. This recipe is inspired by another one of Denver’s delicacies, honey pizza crust, and we decided to incorporate this element into our dessert menu because … why not? Beer is the unofficial, official beverage of the NFL, and Denver just happens to be known as the “Napa Valley of Beer”. Seattle on the other hand is known for its coffee … we all know Seattle’s Best, right? When you merge the two you get coffee? Beer? Nope, you get Espresso Oak Aged Yeti Imperial Stout (which infuses an espresso from a local Denver roastery)! 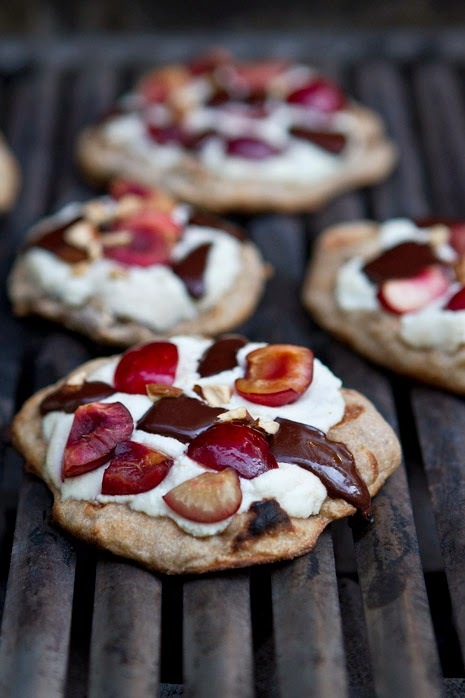 This is a great addition to our menu (plus, what would a Super Bowl soiree be without beer? and what would dessert be without coffee?). We hope you enjoyed this inspiration post. All of the recipe links have been added for your convenience. Let us know if you make any of these dishes for your own Super Bowl soiree, and let the best team win! Our Craft Club is made up of a group of creative professionals. Although we find ourselves in a variety of different fields (everything from production, to law, to education, to design), what we do have in common is our busy schedules. We have decided as a group that we will all take turns hosting our monthly meetings and this week, we had the pleasure of hosting in Lauren’s home. As always, we worked “Side by Side” to do all that is expected of a host; set up a place for our guests to work and provide nourishment for while they complete their craft. To keep with the Valentine’s theme, Lauren prepared her buffet area with heart shaped candles, hot pink napkins, and beautiful flowers. As always, guests brought eats and treats to share that followed a common theme of this time of year … baked goods. On our weekly walk to the Farmer’s Market (as mentioned on our post, Cooking Side by Side: Healthy Eating in the New Year), we picked up this delicious spinach bread with complimentary spreads. They were a huge hit! This month’s theme was left a bit open-ended. As Valentine’s Day is right around the corner, each Craft Club member created something “heart”felt. These handmade Valentine’s were made by our girl Hannah of Hey! Shiny Objects! You can check out more photos on her creative blog from this month’s Craft Club meeting … coming soon! 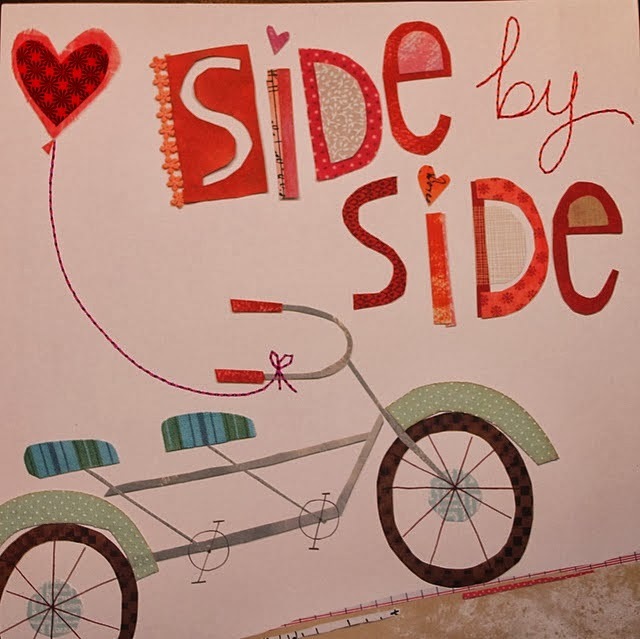 Lauren created these special Valentine’s for the two loves of her life (her husband and her little girl) with a touch of tissue paper, Mod Podge, and other embellishments. We truly look forward to spending time with our Craft Club girls every month and creating something new, whether it be fun cards to pass out, a decor item for our homes, or a crafted edition to any themed party. With Valentine’s Day just a few weeks away, we hope we have inspired you to create your own Valentine’s projects. Keep crafting! Creativity is truly the gateway to so many possibilities, and at Beth Hillel Day School (where Tami teaches Jewish Studies) her students are encouraged on a daily basis to show their creativity in many ways. We have included a speech that Tami put together to introduce some amazing projects at last week’s Open House and Technology Fair. Please enjoy! As you visit our virtual museum tonight you will be told many stories in many different ways. You will be introduced to the story of the Ancient Israelites (our prophets), our synagogue and the Jewish community, celebrating Shabbat with our families, the ways Tu B’Shevat helps to make a difference in the world around us, stories of animals living in their natural environment and what happens when outside factors such as pollution are introduced, and the story of two middle school age girls researching their heritage and how they identify as Jews. These stories although rich in content get even more vibrant when told through art, technology, the writing process in both English and Hebrew, and theater. 4th and 5th grade integrated project – Totems were made to represent the Jewish value of Bal Tashchit (guarding the Earth) and the way Native Americans value the Earth. Students wrote pamphlets from the research they did on four different ecosystems; forest, rainforest, ocean, and arctic and the current issues found in those environments. Tonight, allow me to be your first story teller as I let you in on what has been going on here at Beth Hillel Day School to prepare our students for the journey they are about to take you on. It all started with a question. What if we were to integrate as many subject areas as we can into one cohesive project? How could we deepen our students’ knowledge and understanding of the content they learn? Which turned into several more … What would that look like? Would the teachers be able to find connections through their very different curricula to make this work? Would the students buy in? Would our specialists be able to support us in making this happen? So the questions and this idea of a cohesive integrated project was brought to a staff meeting. Each team of teachers sat down together to collaborate. The teachers were committed. In one of the meetings, the upper grade teachers, our conversation began to breathe a life of its own. We somehow started weaving together a rich tapestry of the nonfiction essay writing they would do in language arts with their social studies unit on Native Americans and the Jewish value of Bal Tashchit (or guarding the Earth). I think anyone listening in on this conversation would have probably thought we were crazy! How could we possibly connect these very different topics? How would we even begin to think of a project that represented learning and research in all of these areas? … and I’m even more certain that the next day when I discussed the idea with our art integration specialist of making a structure out of recycled materials to represent an ecosystem, current issues within that environment, and all while representing the values Native Americans live on as well as the ones we get from the Torah, she thought we were absolutely nuts! However, that is truly what is so fabulous about the teachers at this school. They trust each other (sometimes with reckless abandon), when we believe we have an idea that will transform student learning. 1st grade integrated project – The Jewish community was taught alongside a Social Studies unit on community helpers. Synagogues were built with all of the important factors that go into making it complete; the Torah, Rabbi, Ner Tamid (Eternal Light), etc. Now, would the students buy in? Well, I can tell you that from the very first day the first grade team started discussing our synagogue project with the students, their excitement was infectious! It rubbed off on everyone … Our 1st grade teacher as she planned a writing piece with our writing coach, Our Rabbi as the students interviewed her as a community helper and integral part of our synagogue, and even the first grade parents as they took the opportunity to learn and create right beside their children. The students would come into their classroom day after day, week after week to find myself and our art integration specialist set up for a new creation … the Aron Hakodesh made out of a cardboard box, clear plastic sleeves turned stained glass windows, and a yad made from a simple golf pencil. These ordinary objects may have started out that way, but truly ended up as one child-designed and created masterpiece after another. The excitement never left the room and was still there yesterday when the first graders arrived for art and asked, “Can we do something else to make our synagogues beautiful?” Of course by that point, they were all finished and ready to be displayed, but that question alone demonstrates that the students had been invested all along. ECE (Preschool) integrated project – Learning about trees cross curricular for Tu B’Shevat (the birthday of the trees). TK and Kindergarten integrated project – Creating Shabbat boxes that include ritual items for celebrating this weekly holiday and writing about the “best part”. 2nd and 3rd grade integrated project – Each student wrote a biography of a prophet as well as acted as them (in costume) during Open House night. Did the students buy in? I would say yes across the board. Our ECE teachers taught about Tu B’Shevat through all areas of the curriculum, Students had opportunities to experience this holiday through research on animals that live in trees, tasting fruit, making comparisons, graphing, reading books, and even discovering symmetry while making butterflies. Our TK and Kindergarten classes created Shabbat boxes full of all of the things they need to bring Shabbat into their homes including step by step directions. Our TK teacher challenged them to add to what they already do during Shabbat in their homes, encouraging students to try out new traditions and rituals. And our 2nd and 3rd grade students have taken on a huge role tonight. Their research has enabled them to write a biography independently on a chosen prophet. Their engagement in every aspect of the learning process created individuals who know the content so well that they should (cross fingers) be able to stay in character as their prophet throughout your entire virtual museum experience. and get tech help from qualified teachers. Throughout this process, students researched areas of Jewish Studies and Social Studies, created beautiful pieces of art that followed very strict rubrics, wrote essays and biographies, and created videos to share the process behind the product you will see tonight. You might not believe me when I say that we had 4th and 5th graders who would choose to stay in during their lunch period (without being asked) in order to have more time to research, plan, and add details to their totems. It’s true. In just a few minutes, the next story tellers (our students) will take over. They have prepared their tushies off for this moment. Allow them to tell their stories as you walk around. Ask them questions about what they know, engage in conversation with a living prophet, take a tour through the synagogues with our architects, and use your Smartphone or iPad to watch videos they prepared to give you even more insight into the process. Don’t worry, if you have technical difficulties or if you aren’t comfortable with the interactive museum; our Genius Bar is prepared to help you out. As a follow up to last week’s birthday theme, we are excited to share an extra special post with you today! This past weekend, we threw ourselves a Moroccan tea party in honor of our birthday. It was so much fun to celebrate this special day with our closest friends and siblings. The Moroccan theme (and the fact that it was in Lauren’s home) just made it that much more relaxed yet festive. Our dad was born in Morocco, so although we have never been there, we have always felt connected to that part of our heritage. We love the rich jewel tone colors, gold and silver accents, and comfortable feel involved in this theme. We used orange and silver sequined throw pillows as well as a small silver pouf (from Ava’s nursery) to give cozy spaces to sit. Lanterns were included for additional candle light, and we lit almost every candle we own to create the mood. What is a Moroccan tea party without Moroccan tea? All it takes is a little hot water, fresh mint, and a teaspoon of sugar. Adding these traditional clear and hot pink Moroccan glasses into the mix made it even that much more authentic. A beautiful assortment of snacks is accompanied by a photo of us (the birthday girls). We love the fact that no forks were necessary. These finger foods (or “toothpicked” foods) were fun for all of our guests. Delicious cheeses, crackers, nuts, and dried fruit were the perfect mix. Fresh fruit, figs, dates, and raisins were selected at our local farmer’s market. We even made special stuffed dates for our guests to enjoy. Lauren’s dining table was set with an assortment of Moroccan style cookies found at a local kosher market and the most delicious dates we have ever had … they taste like butterscotch and melt in your mouth! Each of our friends had so much fun socializing, meeting new people, and mixing their own drinks. We made our signature cocktail for the evening (3 parts Fireball, 2 parts Amaretto, and 1 part orange juice) and passed it out in shot form for a special “cheers”. What else could we ask for? It was truly a beautiful day (in the 80’s) in LA and turned out to be a beautiful evening as well. Our friends enjoyed lounging outdoors. As we figured this would be the case, we brought the theme outside as well. As twins, we truly love getting the opportunity to share our special day together and love to involve our friends as well. As designers, we love to choose a theme for our own events and see it carried through to the decor, cuisine, and overall flow of the party. We would love to work with you Side by Side to create a concept for your next at-home event. Let us know what we can do to help. We are just a quick email away! It is officially the week of our birthday! As twins, we have always shared this special day; celebrating together, opening identical presents, and enjoying our favorite things. We love sharing our birthday and planning our birthday parties Side by Side, but there are also many things that set us apart. As we feel that our birthday is a great time to share information about ourselves personally and as designers, we have prepared a small Q & A session for our readers to gain insight into our lives. We hope you enjoy! *Please note that since this is a “T Side / L Side” post we will both be answering the questions, however the structure has changed a bit … all you really need to know is that “T” is Tami and “L” is Lauren. Q: What are five things you can’t live without? T Side: Family (especially my twin sister and my niece Ava), friends, my independence, anything spicy, and a comfy place to rest at the end of a busy day. L Side: A good pair of black leggings, my iPad and iPhone (I use them for everything), my twin sister, my husband, and my adorable little girl. Q: How would you describe your personal design style? T Side: I love to mix hard and soft, adding an edge to an otherwise feminine aesthetic. I guess my design style would be classified as eclectic, but I like to think I have a style of my own. 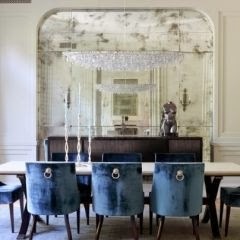 L Side: Although I love to design in lots of different styles to fit my client’s needs, my own personal favorite style is transitional with a bit of glamour. 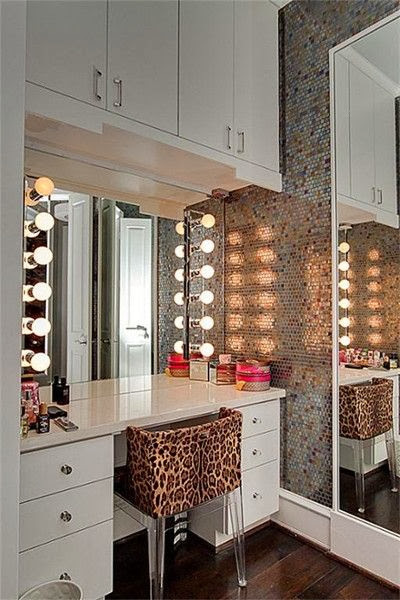 I love everything white, antique mirrored, with clean lines, modern details, and vintage pieces mixed in. Q: What is your favorite item in your home? 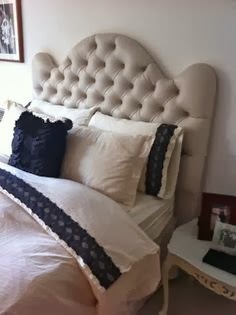 T Side: My white leather tufted headboard that my dad made as a gift for me. 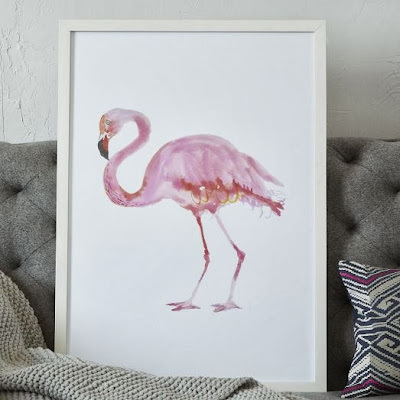 Either that or a new painting I bought from West Elm of a flamingo (Oops, was I supposed to choose just one?). L Side: I would say my bed as well. 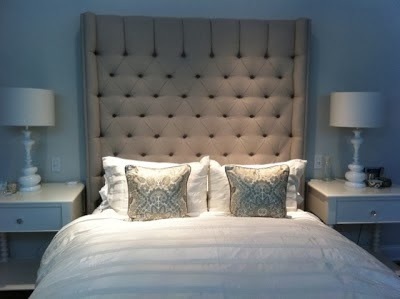 I love my custom headboard and my bedding is super cozy. Q: What is one thing you have splurged on that others should too? T Side: A great fitting pair of jeans! L Side: I tell my clients that it’s always worth it to splurge on a good area rug (something I took my own advice on) and even more importantly a pair of brand name shoes! Although my husband says never to walk on the rug with the shoes. Q: What are your best tips for balancing work and personal life? T Side: I won’t pretend for a minute that finding a balance is easy. As a single lady, you would think my only priority is finding some guy to “put a ring on it”. Of course, throw in a teaching career and a blooming design business / blog, and like I said it is not easy. What are my tips? Work hard, play hard! Reward yourself after a hard week of work with a night out with the girls. Keep dating as a top priority, otherwise you will be so busy working (although I happen to love what I do) that you will forget to live your life. L Side: Always, always be in the moment! Set goals, create lists, and stick to your daily plans. It’s not easy to put down your work at the end of the night (especially when it is the only quiet time in your house living with a six month old baby), but I try to make time to sit in front of the TV and watch a good show with my husband before going to bed. Stay tuned for more birthday week to come and details from a special celebration on Monday. Until then, we leave you with a quote from one of our favorite childhood books that we believe describes us perfectly, “Sometimes we are the same, sometimes we are different, but we are always twin sisters”.